There is nothing we love more than elotes, which is a Mexican street corn treat, where grilled corn is slathered in spices, herbs, and cheese. For a party, it’s a little hard to bring a tray of elotes so I made a salad in the same flavor spirit. I won’t go so far as to call it esquites, because I don’t serve it warm, but it’s fairly close. 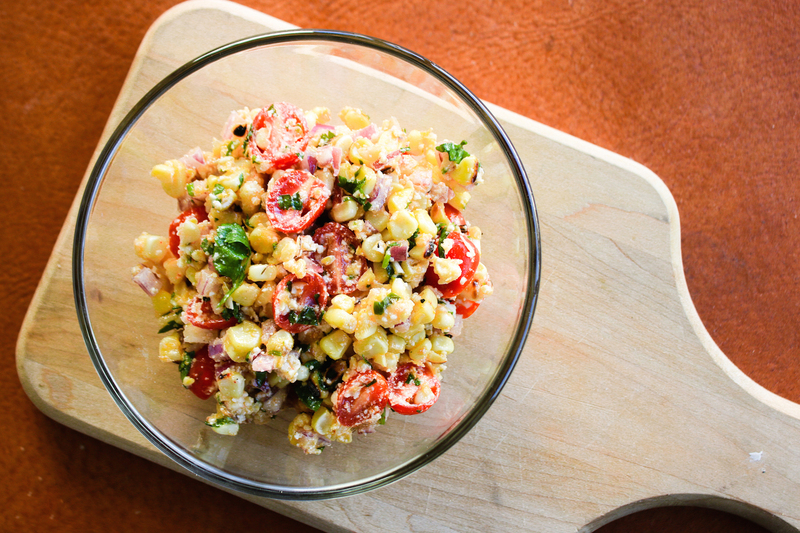 This may look like just a boring old bowl of corn, but when these flavors come together, some sort of magic happens. 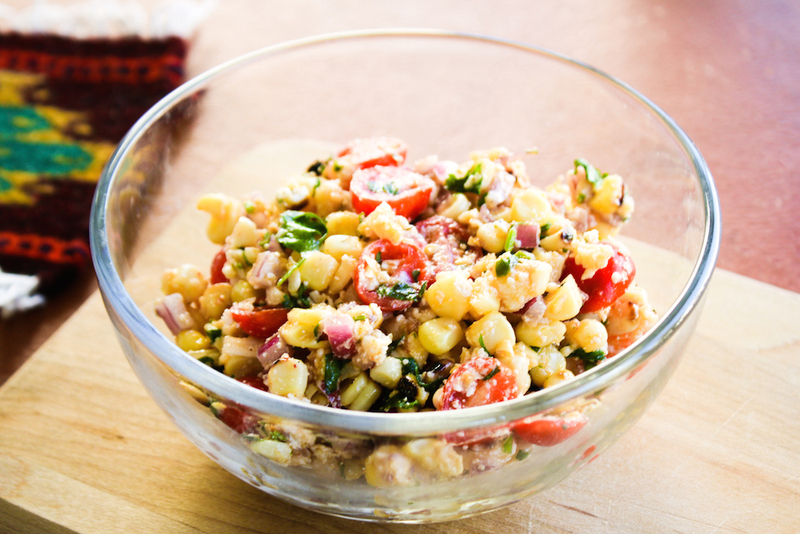 This corn salad disappeared as quickly as the queso at my last party, and that is saying something. Remove the husks and silks from the corn. Soak the corn in water for about 20 minutes. Heat up a grill and grill the corn, turning every few minutes, until it has a good black char on it. Slice the kernels off the corn and place into a bowl. Let them cool. 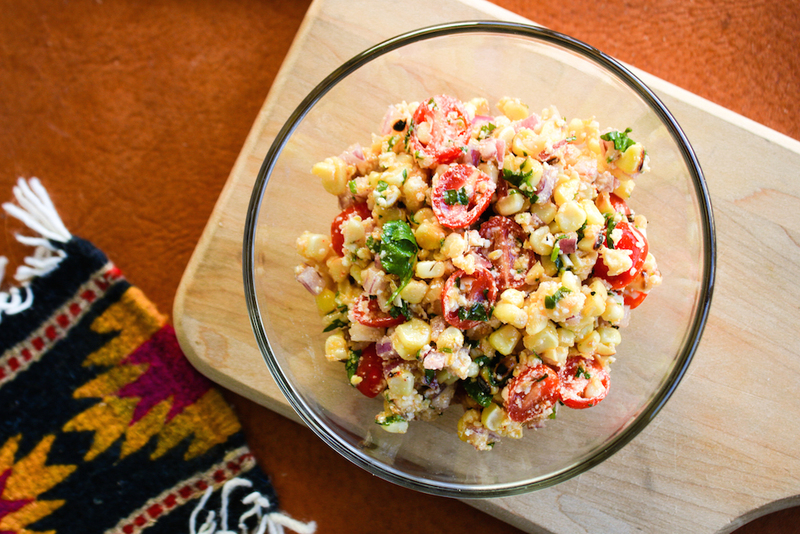 Once cooled, add the tomatoes, cilantro, red onion, and cheese. Make the dressing by combining the lime juice, chili powder, cumin, and olive oil. Place in a jar and shake to combine or whisk until emulsified. Pour it over the salad and stir to coat. Refrigerate until chilled, about 20 minutes. The longer it sits the more the flavor will combine. I would eat it that day, but it is good for a couple of days of leftovers.